As a feminist, negotiating my steadfast belief in gender equality with my extensive beauty regimen is a struggle. Third-wave feminism teaches me that my traditionally feminine gender expression—my bright red lips, my curled hair—doesn't have to conflict with my devotion to the fight for equal rights. And I do genuinely enjoy the ritual of putting on my makeup every day. But logically, there's something about it that I can't quite make sense of. When we say we engage in beauty rituals as a form of self-empowerment, not to please men, I have to wonder how much of that is true… and how much have we simply been brainwashed by society to believe it's true? In other words, if we lived in a time when men and women were truly equal, would makeup even exist? I don't mean to get all think-piecey on you, but since I make my livelihood in the beauty industry, I can't help but feel haunted by these ideas. I had never been able to land on a definitive answer about the role of makeup in a feminist's life. That is until I watched this speech from Jill Soloway, creator of Amazon's groundbreaking series Transparent. At the Makers Conference earlier this week, Soloway took 14 minutes to speak about gender expression and beauty, finally putting into words the ideas that had been swimming in my head for years. Keep scrolling to learn Soloway's brilliant theory about why women really wear makeup (and click here to watch the whole speech yourself). 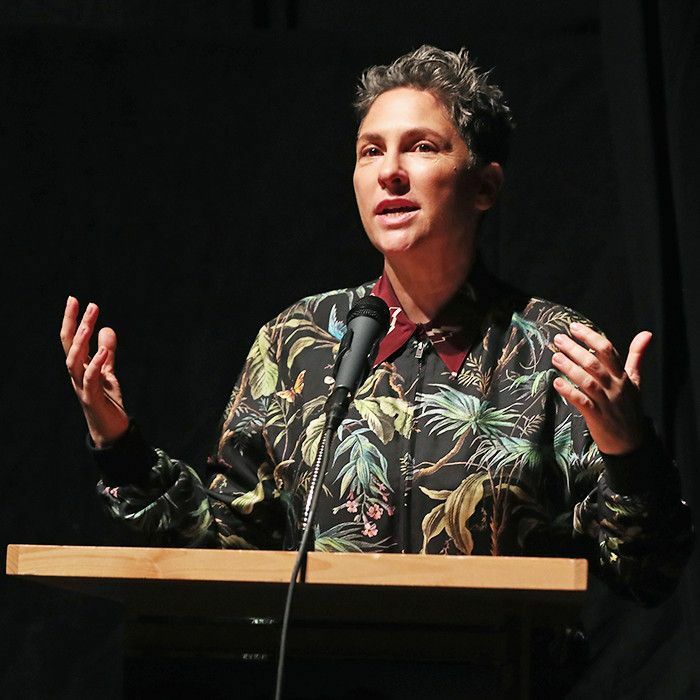 The Jill Soloway who stands before us today has a short, neat haircut; a collection of dapper suits; and when she gets her makeup done for an event, she tells the artist, "Only give me as much as you would give a man." It's a more masculine presentation than the long-haired, dress-wearing Jill we knew five years ago. But her gender identity has not somehow changed. It's simply that in recent years, Soloway has started more closely examining the role that makeup plays in her life and her gender. Soloway recalls getting ready for an event a few months ago and physically recoiling from a makeup artist as he prepared to apply her liquid liner. "I was going downstairs to speak to a bunch of people about business… and yet here was a man who was sent to draw a new face on top of my face so my words would be heard," she says. "And I got really offended. … And then I thought, what if I never wore makeup ever again?" Soloway acknowledges that someone women feel more confident wearing makeup because they think it makes them "look" better. But she challenges us to question the idea that women are expected to present themselves as something to be "looked at." "I often wonder if the layer of beauty we add before going out in the world has a very subtle but symbolic consent to be taken in aesthetically first, intellectually second," Soloway says. I often wonder if the layer of beauty we add before going out in the world has a very subtle but symbolic consent to be taken in aesthetically first, intellectually second. Of course, this idea that by wearing makeup we are subtly yielding to the male gaze does not address the fact that some women genuinely enjoy the ritual and creativity of makeup, regardless of who sees it. Which begs the question, can't makeup serve a purpose that isn't directly linked to gender dynamics? Soloway does not personally take pleasure in makeup, but I do, and so do many of Soloway's female friends, both cisgender and trans. According to Soloway's observations, for some women, sitting down at the vanity and taking an hour to get ready serves as a "permission structure to relax." It's a time to slow down, to do something fun and artistic. Soloway says she's witnessed everyone from personal friends to the Kardashians use makeup this way. It's similar to how men often use golf as an excuse to escape and relax—for women, the beautifying process serves this same purpose. This made a world of sense to me. For her, being feminine and being glam was a permission structure for relaxing. So what do we do with these observations about the utility of makeup and the subtle repercussions it has in the world? "Am I suggesting that you all go to your rooms right now, remove your Spanx, remove your makeup… no, I'm not saying that," Soloway says. "But I do wonder if it's a problem in this fight for equality that the space between our indoor faces and our outdoor faces has so much more distance than men's. … Because in patriarchy, men see, and women are looked at." Soloway says she doesn't intend to "offend anyone who loves their makeup," she simply invites us to question the default mindset that men are the subjects and women are the objects. The fact that men are able to engage intellectually before anyone has the chance to comment on their appearance is a form of privilege, she says, and it's something we should all have access to. In patriarchy, men see, and women are looked at. At the end of her speech, Soloway poses this question: "How much pleasure does your gender allow you? Do you like the time it takes to 'get ready?'" If you're like me, then by all means proceed, she says. But also know that you can use your body "to signal that you are the subject." Today I'm wearing pink lipstick and a silk dress and about 80 coats of mascara, but Soloway's words remind me that tomorrow, if I choose to, I can scale the makeup down, tie my hair back, and put on a tailored suit; and I'll know that such a gender presentation might help communicate in some small way that I do not consent to being looked at. That a small piece of male privilege can be mine, or yours, if we're just rebellious enough to claim it. Click here to watch Soloway's entire speech. And watch the teaser below! What are your thoughts on Soloway's theories about makeup? Sound off in the comments below.